Werewolves... vampires... swamp beasts... zombies... even a Jersey Devil... all of these chilling creatures and more await you in this haunting collection of 11 contemporary horror fiction stories by Mark Wesley Curran. Uniquely set 'down the shore' in South Jersey's Cape May County, these scary tales are sure to terrify and entertain both adult readers as well as young adults. The stories in this collection contains: The Girl In The Attic, Dante's Inferno At Castle Dracula, Neptune's Revenge, Night of the Wildwood Dead, Captain Harvey's Wildwood Seafood Palace, Showdown In Anglesea, The Fortune Teller Machine, Jersey Devil, Werewolves of Dennis, Swamp Beast of Grassy Sound, and The Witches of Wildwood. If you enjoy short stories, horror, folklore, and wondered about New Jersey, this collection of tales by Mark W. Curran will fit the bill. 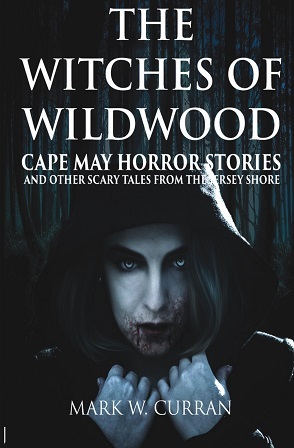 I gave Witches of Wildwood: Cape May Horror Stories and Other Scary Tales from the Jersey Shore 3 ½ sheep. “I feel so alive!” Zoey exclaimed on the morning after they’d tied Harlan Clemmons to a chair and stabbed him multiple times through the heart, “like I’m plugged into some bitchin’ electrical source!” she marveled. Mark Wesley Curran is a writer of contemporary fiction, specializing in the horror and suspense genre. Born and raised in Suburban Philadelphia, he spent many summers living and working in Wildwood, New Jersey during its heyday. He now resides in Los Angeles where he enjoys creative pursuits as a writer, filmmaker, and musician. Please note the Amazon link is incorrect and links to the original paperback edition which was withdrawn from publication and never released because the publisher decided to publish in hardcover instead which should be available Sept 15. I deleted the amazon link. Will add once the new on is available. Thanks!